HAMMERCULT Stream New Song "Metal Rules Tonight"
Tel-Aviv Thrashers HAMMERCULT will release their debut album Steelcrusher on CD and colored vinyl February 4, 2014 in North America via Sonic Attack / SPV. The new track "Metal Rules Tonight" is now streaming and you can check it out below. There can be no doubt: HAMMERCULT are hell-bent on stirring up the international metal scene with their hard-as- nails debut album. Chris 'Zeuss' Harris (SOULFLY, HATEBREED, AGNOSTIC FRONT), mixed and mastered the album, and Andreas Kisser (SEPULTURA), contributed a furious guitar solo on "We Are The People". Shochat is confident that HAMMERCULT have the perfect record company by their side to back them in their ambitious goals: "Lots of important metal bands signed with Noise Records in their early days. That's why we're particularly happy that Steelcrusher will be out on Sonic Attack, Noise founder Karl Walterbach's current label. So as fans of that great Noise era, we've come full circle in that respect." 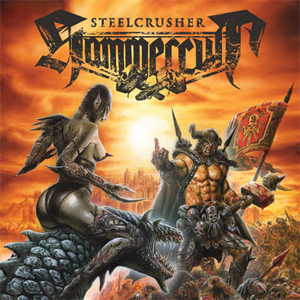 Yakir Shochat and his band have enlisted the legendary cover artist Andreas Marschall (the Berlin-based artist has worked for BLIND GUARDIAN, IN FLAMES, RUNNING WILD and KREATOR, among others) for the Steelcrusher artwork. "In The Name Of The Fallen"